Hello everyone~ Saturn's on a bit of an LOA/MIA doing all sorts of awesome trips and stuff, so I, Sailor Uranus, will be hosting February's two-week event! YOU READ CORRECTLY: CRACK. SHIPS. As in an unlikely pairing! 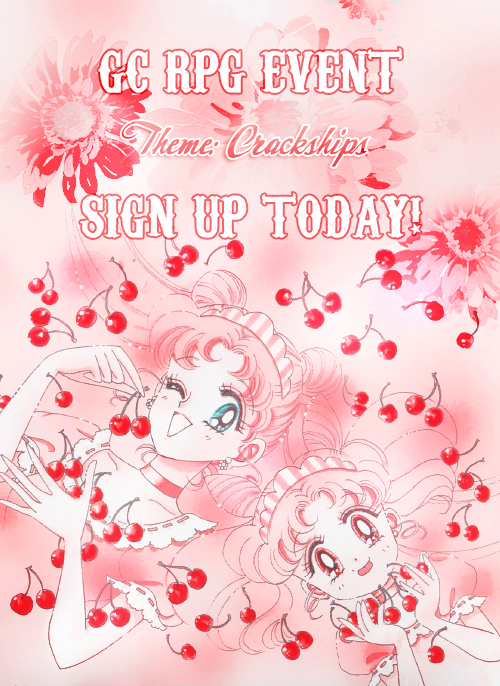 Now, unlike the typical definition of crackships, which have romantic undertones, this RP Event is more along the lines of the Nehellenia Arc of the Stars Anime, where senshi are paired up randomly and have to work together to reach a common goal. Sign-ups end Tuesday, February 17. Sailor Uranus will randomly pair participants and create a special board for them in the RP Events forum, and give them a goal to work towards. What kind of goal? Eh, Idunno, could be as simple/hard as choosing the perfect present for a third party, to solving a mystery. This is the Official Roleplay Event for February; participants can cross off their Roleplay Event square in their Activity Cards! Participating in this event counts towards this month's Challenge! This event is considered 'relaxed', so no word count requirement on posts. If you have any additional questions, please inquire below! READY, SET, SIGN-UPS ARE OPEN! Here are our threads and CRACKSHIPS! JupiterThunderCrash Scavenger Hunt: Crystal Tokyo festivals are filled with crazy events - including pairing random people together to participate in a scavenger hunt! Will Sailor Io and Sailor Juno be able to work together well enough to be the first to work through the scavenger hunt and find the prize? Miss Moon Rose It's my First Time: Sailor Chibi Mercury is off on her very first mission to prove herself as a senshi! While the set-up is prearranged, she'll have to do her best to impress her evaluator, Sailor Neptune. When Chibi Mercury finds herself facing a difficult decision, will Neptune be able to assist while still remaining an impartial judge? Mysteryloveandjustice Locked In: The pair find themselves locked into a department store in the mall together! With alarms set and the guard obviously elsewhere, how will they keep themselves occupied until they can get out of there? Sailor Mercury Hot Rod: Rei has a problem. She's cracked her transformation stick. While at first the side effects of transforming with it were minor - who doesn't love flaming hair? - lately it's been getting a little out of control. Not wanting Luna or Artemis to find out that she, perfect lovely little Rei-chan, could possibly have done something so clumsy that even Usagi had yet to do it, she turns first to Ami to see what she could do. When soon after the pair are charged with hunting down a stray youma, it's time to see if Mercury was able to correct the issue! Cosmos Hime Codename Golden Falcon: A priceless heirloom has been stolen from the Hammer Price Shrine, and it's up to Tubby Mask to bring the thief to justice and secure the precious Golden Crystal Falcon! Minako, while out shopping, spies Tubby Mask in action and decides to tag along (and make sure he doesn't get into too much trouble...) as her alter ego, Sailor V! Flat Tire: A flat tire leaves Makoto stranded on the side of the road. Harley Quinn, driving through on her motorcycle, decides to stop and help her out. Harley, however, just happened to be on a mission at the time - well, the more's the merrier, right?! Anait Zelliere Girls Just Wanna Have Fun: Sailor Solstice is having some sort of day. She woke up, went outside, and came face to face with a blonde stranger! Her name is Achelois and she claims she's on a mission: her partner is somewhere in the city and is suffering from amnesia and Achelois needs Solstice to be her guide to help find her! ... however, as the day progresses, she starts to get the feeling Achelois just wanted to be shown a good time while her partner was otherwise engaged. Oh well, beats being bored! Sailor Venus Blind Date: Rei and Minako have been set up on a blind date! The nerve! Will they go through with it, or will they end the date before it begins? Aurae Lost: While out on a difficult mission set to her by Neo Queen Serenity, Sailor Uranus loses her way and comes across a young senshi... who has also lost her way. Can they help each other find their way back home? Artemis Locked Out: Lead Crow needs to get into a building, but no matter how much she huffs and puffs and attacks, it's incredibly resilient! Not even a scratch! She's getting frustrated - something important is inside - when she notices a stray cat hanging around the place. Did it know the way in?! What would it make her do to earn the favor?! We have until February 28th! Have fun everyone! I would like to sign up with Sailor Uranus! I don't have a profile for her yet, but since you're not asking for one... what a perfect opportunity! actually I think I want to try my hand at playing Sailor Lead Crow. I'll sign up as Sailor Io. Wow, this sounds like a lot of fun! I'd love to take part! By doing this, I'll take the first step towards the roleplay section - I'm so excited! Okay, I'll sign up as Sailor Jupiter! I want to go outside of the box and role-play... Kaolinite. And if you need a man lol, then I can also play my otaku villain, Fox's Eye. OH YES. MY TIME HAS COME. GET READY FOLKS. 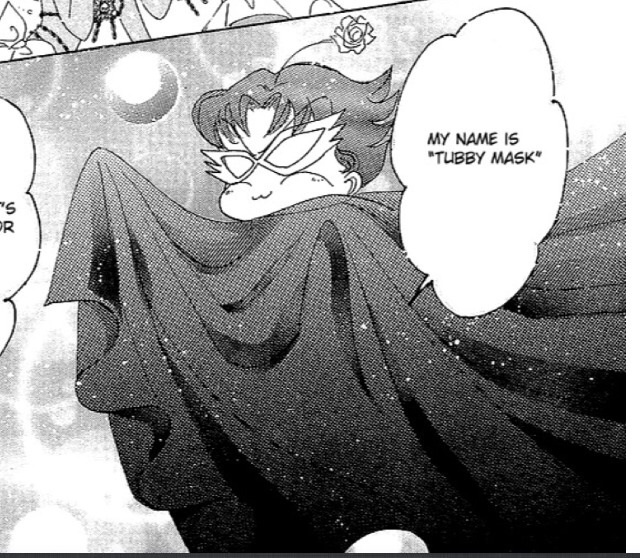 TUBBY MASK IS HERE. I think I'd like to get back in the swing of rping...I'd like to play Sailor Juno! I'll signup as Sailor Chibi Mercury, since I've been wanting to play around with her more. What the heck - this sounds interesting enough to dip my toe into role-playing on GC. And to make this easier for me, I'll play Sailor Mercury. Well this sounds interesting, now who should I sign up with???? I take it back! Can I be Rhett Butler/Bakene? XD and for super clarification, multiple claims are allowed in this event as people will be pairing off! Well, I guess a relaxed roleplay is a good way to ease into the forums. I'd like to sign up with my OC Sailor Solstice. I don't have a profile yet so I'm glad you're not asking for one. Sailor Solstice -- senshioftehsolstice1339 welcomewelcome! Today's the last day to sign up!